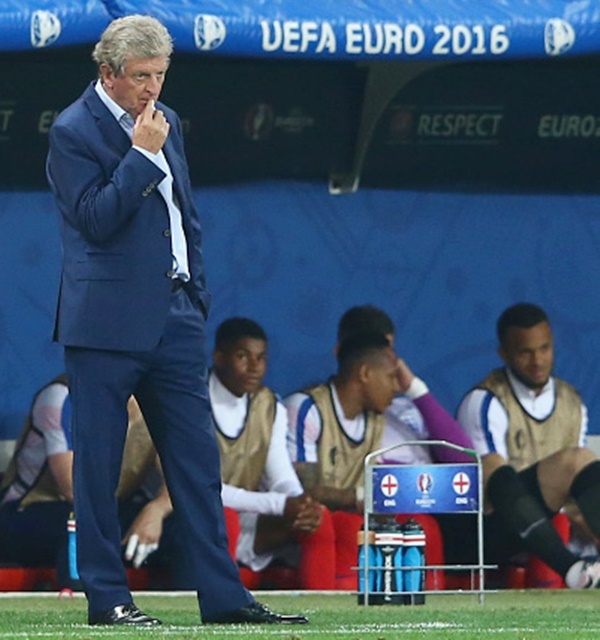 IMAGE: Roy Hodgson manager of England looks on during the EURO 2016 match against Iceland. Photograph: Alex Livesey/Getty Images. England soccer coach Roy Hodgson's four-year reign came to an abrupt end after their shock 2-1 defeat by tiny Iceland at the Euro 2016 round of 16 stage on Monday. Hodgson, 68, wasted little time in announcing he was stepping down at the end of his contract when he read a prepared statement at the post-match news conference. "We are out of the Euros so now is the time for someone else to oversee the progress of a hungry and extremely talented group of players," said the man who replaced Italian Fabio Capello. "My contract was always going to be up after this tournament. I would have loved to have stayed on another two years, but now it is time for someone else to take over this group of players," he added. The coaching staff of Gary Neville and Ray Lewington, who sat with Hodgson at the news conference, are also leaving. The much-travelled Hodgson was handed the post after a club career mostly served in England and Scandinavia and with a spell as Switzerland coach on his CV. Harry Redknapp had been the media favourite for the job but was overlooked by the FA. Hodgson had a good record in qualifiers, with England enjoying a perfect 10 wins in their section to reach Euro 2016, but he won only three of 11 games at major tournaments. England reached the quarter-finals of Euro 2012, losing to Italy on penalties, before a dismal 2014 World Cup where they exited at the group stages without winning a game. Hodgson paid tribute to his squad on Monday although their poor performance in the defeat by Iceland did not reflect well on players who mostly feature in the Premier League. "They have done fantastically, and done everything asked of them. When I arrived I was told that players would not turn up or pull out at the last minute but I haven't seen any of that," said Hodgson. "It's been a fantastic journey, the last four years. I will look back on it with pride. "I'm sorry it's ended in another exit but these things happen and I wish you the very best and I hope you can still see an England team in a final of a major tournament very soon, something that we have been unable to deliver." The FA issued a statement saying: "Like the nation, we are disappointed to lose this evening and that our run in Euro 2016 has come to a premature end. "We back Roy Hodgson’s decision to step down as England manager and will discuss next steps imminently. "For now, we congratulate Iceland for reaching the quarter final and wish them well against France at the weekend." England under-21 coach Gareth Southgate is the favourite to take over from Hodgson followed by Crystal Palace's Alan Pardew.